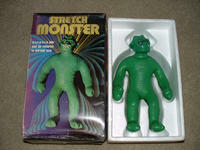 Please go to Photo Gallery 2 for more Stretch Monster pictures and information. Soon I will be expanding the Stretch Monster Cave to include those on page 2 and more. The Stretch Monster stands alone as the finest most collectable stretch ever produced. These Monsters are commonly found still soft and very stretchable. There skin is most often found to be very supple with no signs of latex breakdown. The scaley skin pattern is the coolest! 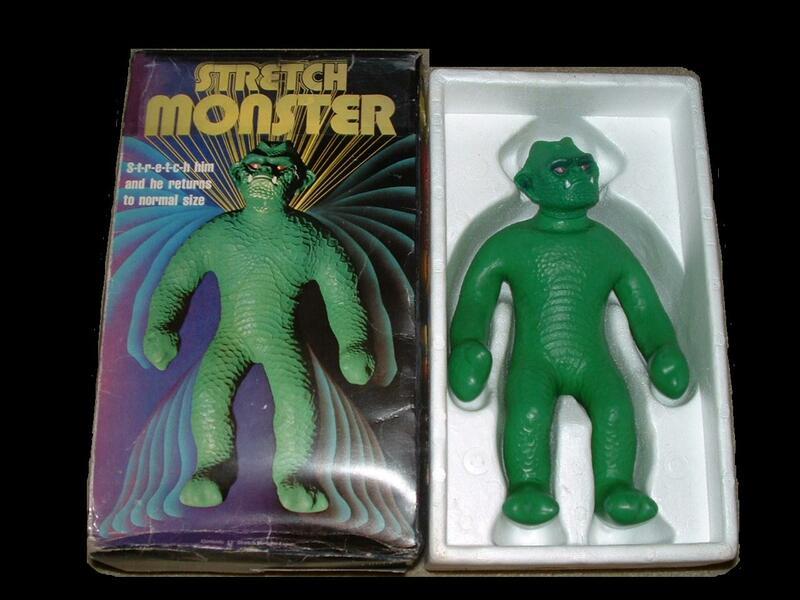 The Stretch Monster to say the least was ultimate perfection in stretch figure production. Truely a work of art. 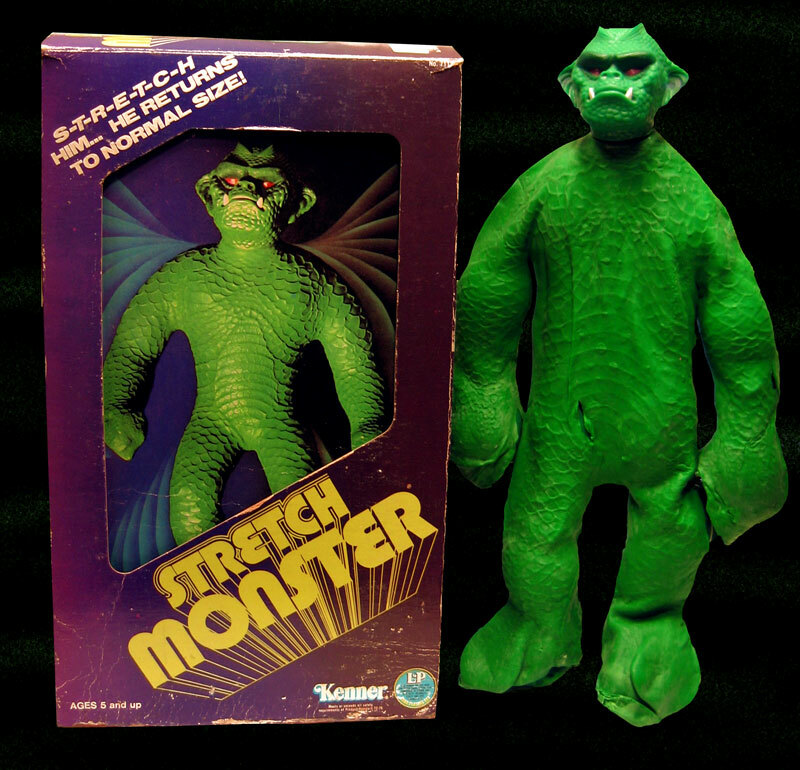 There are now 9 versions of the almighty Stretch Monster! only recently has yet another version from canada been discovered! 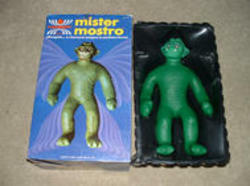 9 versions of the Great Stretch Monster were produced. French (Candian) Monster,Highly valuale and obscure! All these Monsters have the same body types and Heads and were basically reboxed identical monsters except for the Tsukuda Japenese version which has a totally different Head type and a slightly different body and skin.Also the Mini Tsukuda Monster ( A very rare one of a Kind piece) is the exact same body and head as the larger Tsukuda Monster except it is only about 6 inches tall. 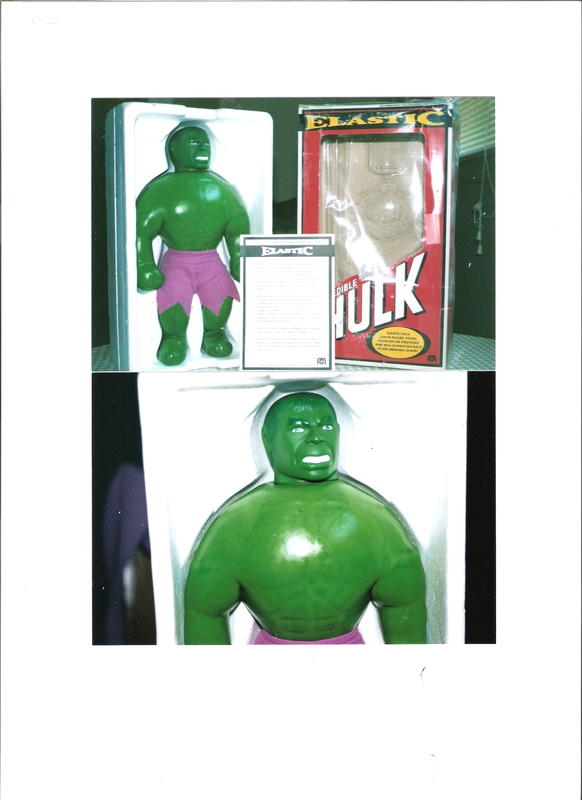 Shown below is the Kenner released Monster. A very fine specimen that made a super big hit upon its release in 1977. Again, This is the most valuable version next to the Japenese and Mexican versions. Any one of the 3 versions mint in box could reach $2,000 to $3,000 each. One of my personal top 5 favorite stretches. 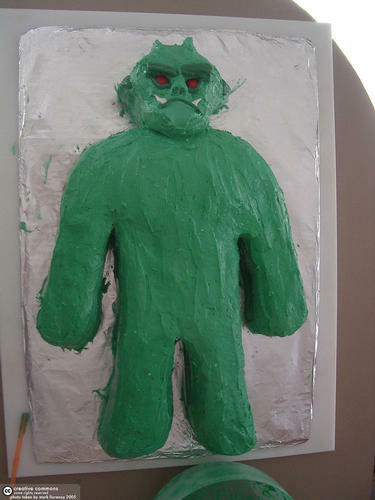 Click on the Below Monster Pic and see the Original Stretch Monster Commercial of Old. Pictured above is a biweekly magazine published by Dow Corning back in the 70s. The Monster made the front page in regards to the latex emulsion that was used in the production of these Monsters which gave them longer life and more stretches.A very cool looking advertisement. 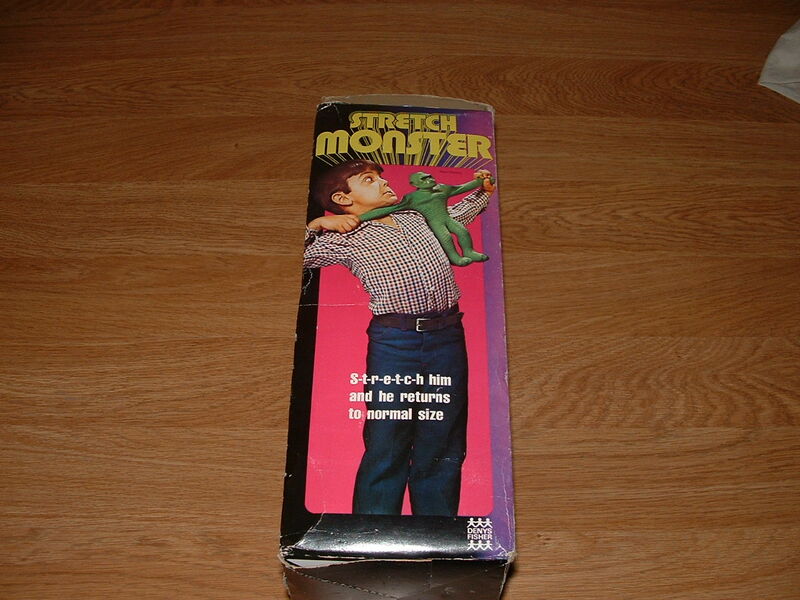 A very very rare 1977 Stretch Monster Box pictured below. This Box has a slide panel that when pulled out allows one to view the monster while still in the box. 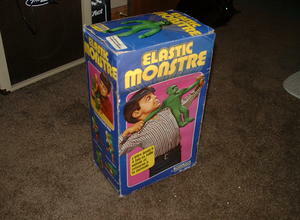 Very similiar to the Mego Elastic Boxes. 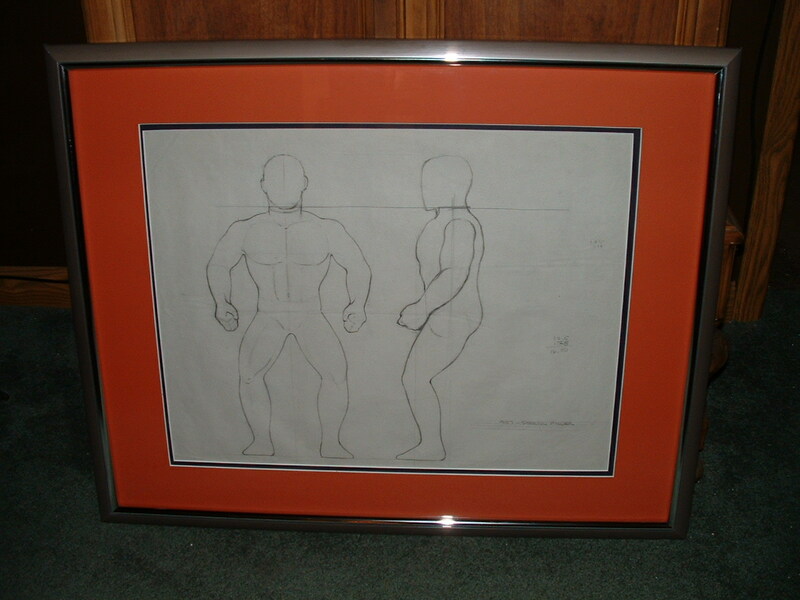 These boxes were produced only in 1977 as the later Stretch Armstrong run was finalized. A totally unseen box version that demands big bucks. Below is the Italian released Monster which were made to perfection. Go figure, The Italians do everything right.There skin is unusually supple and deep green. All the Italian Monsters I have seen have perfect skin. These Monsters are absolutely amazing! This is an absolute must for any stretch collector. Here is a Great Advertisement showing the Monster locking up with no other than the king ,Stretch Armstrong! This appears to be a page from a whoesale catalog that stores would order from. These Monsters were shipped from the factory to the stores in a box count of 6 at a weight of 26 1/4 lbs. Same goes for the Stretch Armstrongs. Below is a very rare Elastic Montre made in France another pic of the box below to the right. This French Version was made in very few quantities and only available in France.This is the only French Version ever seen in almost seven years of collecting. Below is the only Mini Tsukuda Monster ever seen in at least 10 years.This amazingly scarce Monster is only 6 1/2 inches tall as you can see in the photo with the ruler next to him. Notice the cool window style box.The Mini Monster is the exact replica of its larger Tsukuda father.Thanks Eric and Rich for this fine Monster Specimen. 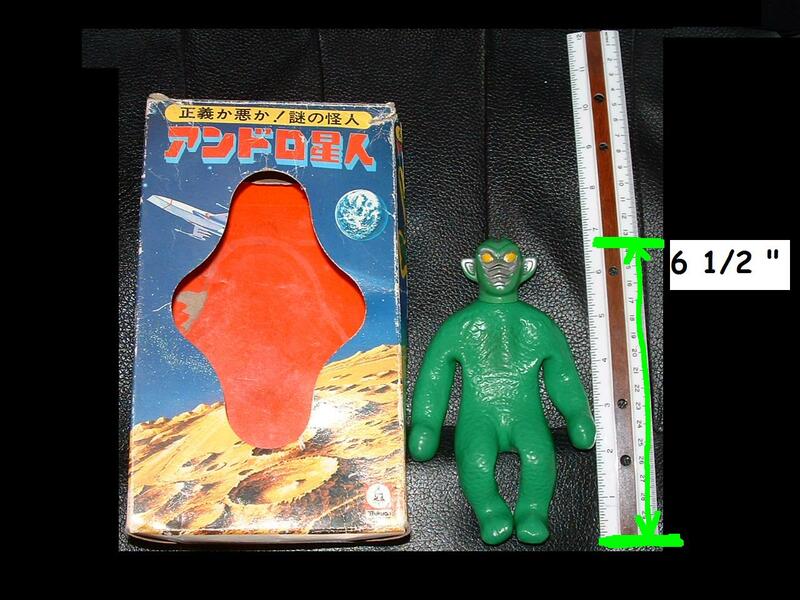 Notice the side view of the Denys Fisher United Kingdom Monster Box Below has the same image as the front view of the French Version above. 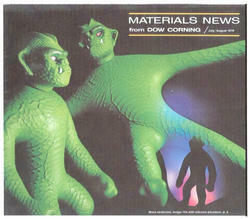 The Denys Fisher Monster is theoretically the same as Kenner. nobody could really tell the difference. 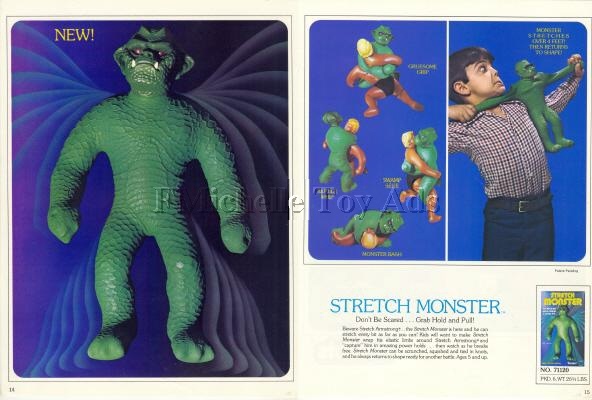 However,The Kenner Monsters do seem to have a slightly different green color. This Color variation is common from one stretch figure to another as the factory dyes were not always exact. 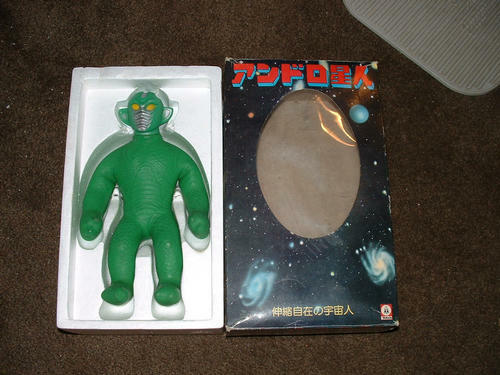 Below,One of the rarest versions of the stretch Monster is the Tsukuda Monster made in Japan. 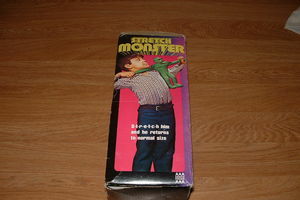 The title on the box translates to Stretch Andro in english.Shown here is one of only about 14 known to exist to date.